​"The daftest thing to do sober." 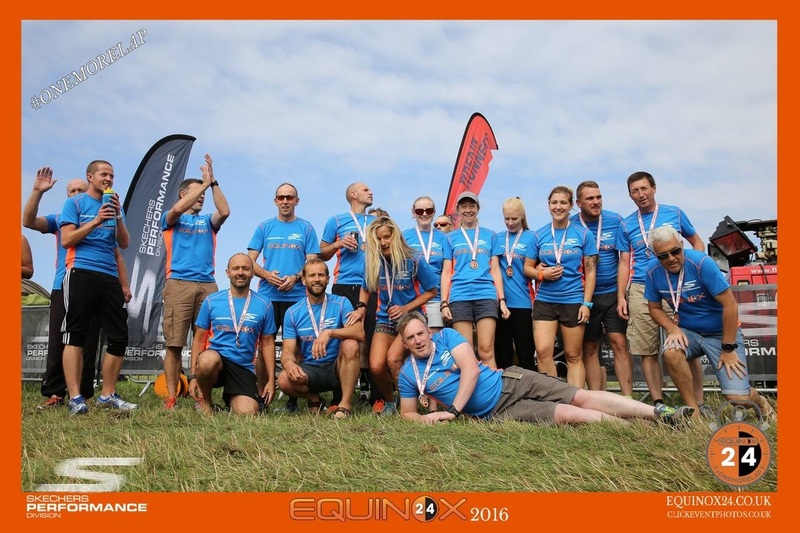 On a very wet and windy weekend in September, 22 hardy souls descended on Belvoir castle near Grantham, to compete in Equinox 24. 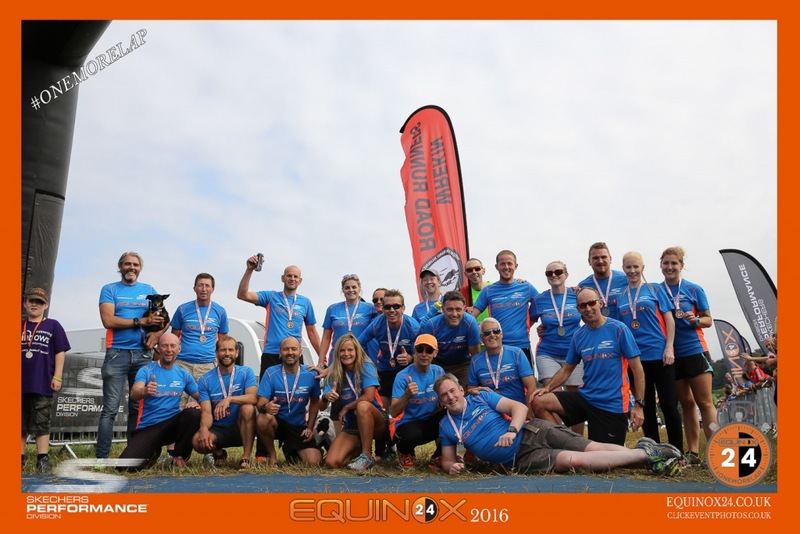 Equinox is a 10k relay race, where your team runs for 24 hours. 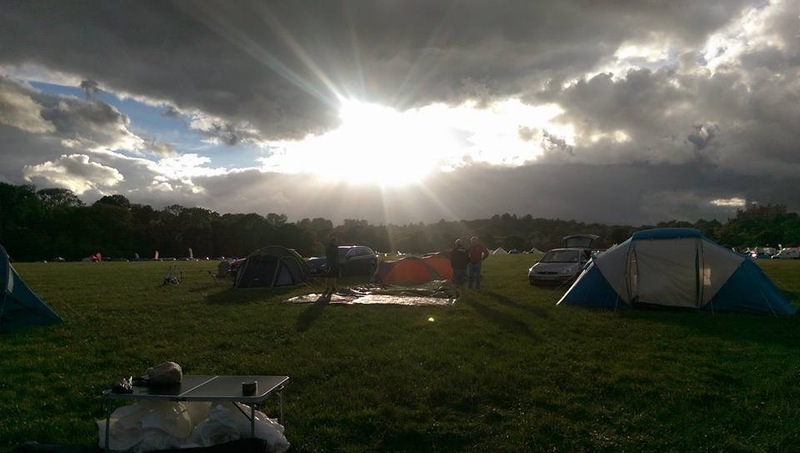 We all started assembling Camp Wrekin, which would be our home for the next 48 hours. Our camp was a few feet from the course, and if we listened to certain members we would have been camped on the course. The rest of the afternoon was spent assembling tents and the most complicated gazebo known to man, took 5 of us to put it up while being directed by Helen, Sarah and Polly. The kitchen that Polly set up was better than the one I have in my house, and the food she produced was amazing. Darren and Carl, did the beer run, which was down a drink then run about 1km around the camp in the dark. We just shout Darren, Darren, Darren, till he passed, then chanted Carl at every one until he ran past. The rest of the evening involved lots of cake, drinking beer and laughter. Saturday we all woke up to more wind rain and the thought of running for 24 hours in the monsoon did not appeal. I thought we were going to drown. At about 10am the rain stopped and the wind dropped as predicted by our fantastic weatherman Dave L.
adventurers. At 12 noon the race started from then on each one of our teams would have a runner out for the next 24 hours. The course was a lovely 10k, with two hills 'Not that hill' which was a long slow incline, and 'That Hill' which was a short, sharp, step hill form hell. There was a hydration station about 5Km at the top of Not that hill. The hours ticked by more laps were run. Apparently shouting only 17 hours to go was not the done thing. 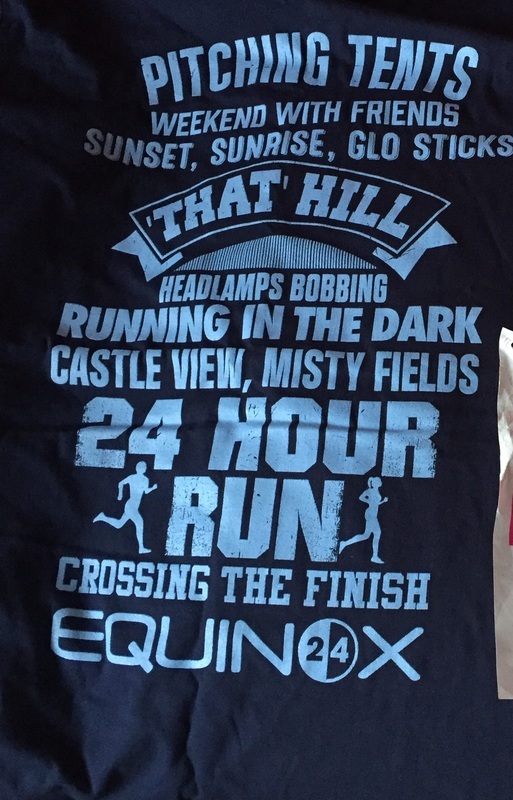 The night laps were fab, through the mist by the lake, watching the sun come up over the trees and cheering on tired runners. The final Lap was run by David Issac when he passed camp we all ran the last 200 yards with him to try and cross the line as the group. David is very very very very fast, and his run to the finish nearly killed us. Poor Lesley had to sprint in flip flops. There were some amazing solo runners that was fantastic to see There were 3 chaps that stood out, Sid in morph suits, and Phillip Box with a Tumble Dryer on his back and a bloke raising money for Help for Heroes' who did 12 laps in full army gear including an 18kg back pack. Our Hero was Helen who stepped up to help out. Helen had never ran more than a 5km before and did her first 10km.. We managed to get her interviewed as she crossed the line. Sorry. The camping and photos are included in the price. The atmosphere was fantastic, every one cheered everyone on. All this was to the chant of 'one more lap'. Between the 3 teams and 22 runners we did 76 laps, which was a massive 760Km or 471 miles, on no sleep fuelled on cake.When I woke Monday morning after 12 hours sleep, stairs were not my friend. Are we doing it again, HELL YES. Already sorting teams for next year... Step up and join us. The 4th of September saw a fantastic turnout from Wrekin as we took the opportunity to do a little something different. 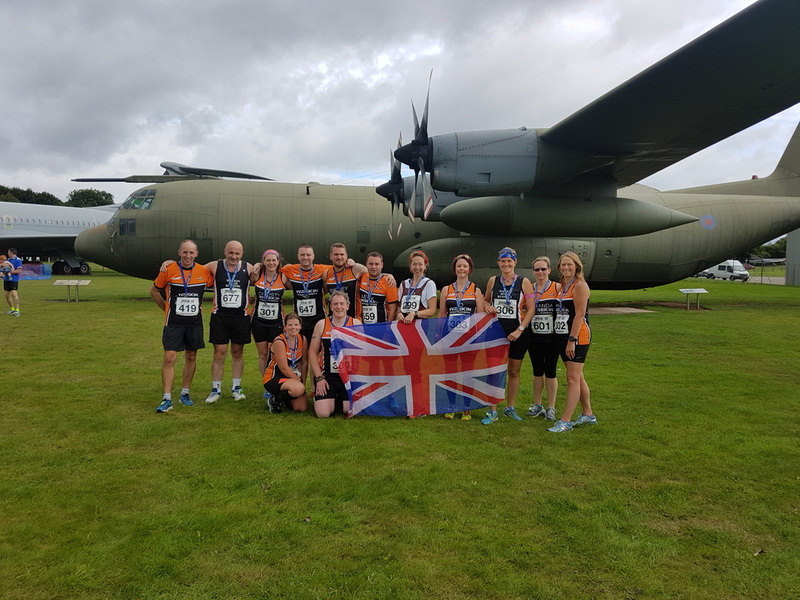 Following a successful 10k race the previous year down south RAF Cosford hosted the Spitfire 10k. A great local race for us to take part in. The day was dry but windy. This was to help keep us cool as we pounded the tarmac. We had a fab morning as we all met up to collect numbers and get ready. The safety briefing took part in hangar 1 by James Mays Spitfire. We were warned the Runway was technically still open and to watch out for landing jets !!! Excited, we gathered at the start line. This was a 10k with a difference. We were doing a looped out and back taking in the Main Runway. Not every day you get to run up and down a main military Runway complete with the sound of gun fire going off in the background. A big shout out to Kathy Ling who ran both Cosford and the London Spitfire in on consecutive days. This is a definite on the 10k race list next year.. its really well organised and well supported..
Last year I went on a weekend trip and stayed near Black Rock sands and loved it. We said we'd go back so that we could go up on the steam railway in Porthmadog, as time hadn't allowed. Then with some other club members, including Sally, I entered Snowdonia Marathon. This would be our 2nd go at it. So I looked for a half for our training and found this race. Sally thought it would be s good idea. So we entered. Race day finally arrived and the excitement of going on a steam train left me feeling rather calm about the whole thing, considering since my cycle challenge I had not done enough of my run training due to a poorly ankle. I had done 1 Wrekin run and one bottom to the top run. However this race was running downhill, easy, right? I met Sally in the carpark... She was still getting her kit on in her van. I for once was a little more organised having being able to pick up my number the night before along with goody bag including Tshirt, bottle of Purple Moose Ale, bottle opener and 9bar pumpkin seed bar. We went over to the railway where we caught the train up to the start. The journey took about 1hr 10 and family and friends were also allowed to travel up and then back down following the runners for a 1/3rd of the price. On the train journey I convinced Sally to run with me.... I wanted to AV. Around 6.11 per km. Sally agreed, much to my astonishment however she obviously was respecting the downhill race terrain!! Sally didn't know at this point Darren thought she was from New Zealand! We had one guy approach us asking if we had left Kathy Ling at home, which made us smile. The train actually counted us down to the off and sounded his whistle and we were on our way.... Starting off on a Tarmac incline and then down towards a sty. Which we had to queue to get over. Already before the 1st km I knew my AV. Pace was not going to happen. Sally leading the way on the slippery downs, her Wrekin runs and earlier Race the Train paying off and I was pacing us the best I could on the straights and ups, yes this was a downhill race with many ups. ​So there was only one thing for it, enjoy the views.... Which were fantastic, this was a really challenging race. We got to the 1st water station and I need a loo stop so Sally carried on but I soon caught her, even though she'd left a message with the Marshall to say she was way ahead, ha! We ran through mud; across bridges, stepped through streams, descended steep declines, every corner we turned seemed to include another incline to climb. We could hear the train and even smell it for most of the race. We even climbed ladders?? To get from one field to another. We both thought after seeing a Garmin Profile of the race that it was in fact only 12.2 m which kept us going so we were complexed when a marshal said not far now only 2.5 miles to go!! We both quickly did the maths I knew that meant actually it was measuring 13.5?!? However we could also work out we were also very close to sea level. The organiser congratulated and mispronounced our name which Sally made sure she corrected.... He'd ran a fell race up the Wrekin too. There was only 155 in the race and we took 123rd and 124th place. We were pleased not to be last, we didn't fall and looking forward to Snowdonia being much easier than our training run !! 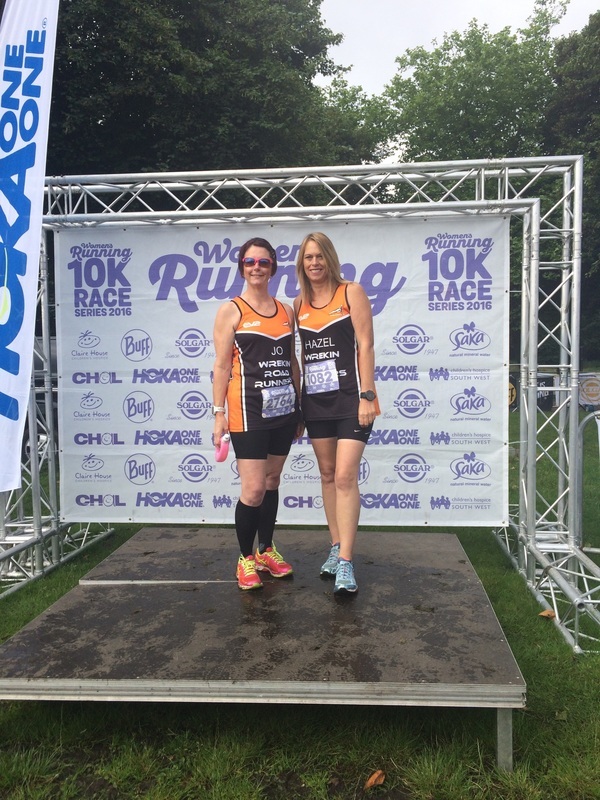 Had my arm twisted by Jenny to write this, so here goes, first ever race report! After marrying into a Danish family many years ago, the prospect of running a half marathon was too good to resist. Jenny had already booked her spot and after a quick call to my daughter, we had entered too. We arrived in Copenhagen at lunchtime after a very early start. Jenny had already made friends with the elite athletes and race compere at her luxurious hotel. We dumped our bags and headed to the expo. It was well organised, easy to find and locate numbers. The t shirts were on display, men's and ladies fit, and you were able to try for sizes. It all boded well for Sunday. A 11 o'clock start was perfect, not up at the crack of dawn, and enough time for breakfast to settle. Easy to find the start, just follow the hoards of people on the already closed roads. Amazingly after arriving just a few minutes later we bumped straight into Jenny. Not bad seeing as there were 22,500 runners plus all the families and supporters. We had a photo opportunity and wished each other well for the run. I had made the decision to run with becky and we were going to enjoy the experience together. Although the opportunities for PBs were there for the taking. A flat course and pacers for every 5 minute finishing times. You could really go for it. I have to say the streets were packed with support from start to finish. The music zones were brilliant with everything from rock, brass bands, opera, children choirs and hip hop blasting out. The hydration stations were plentiful and well stocked with water, high 5 energy drinks, fruit and water showers. It was great hearing "Hazel Nielsen, I'm coming to get you". Jenny had had a great run and caught us up from starting in the wave behind. Fabulous running Mrs Harrower! We kept her in our sights as she ran ahead and I encouraged Beck to start to pick off a few people in front so we could all finish together. And we did, all 3 of us, hand in hand. What a great run it was. The post race experience was just as good as the pre race experience. A lovely medal, water, protein drink and snacks, Danish pastries, fruit, massage area, yoga area and Beer!!! All free! And equally important, lots of space to relax and soak up more atmosphere. Absolutely, I'm already saving my £2 coins! Sorry guys, but this one is strictly just for the ladies.... As I'm sure many of you will have seen the Women's Running Magazine, have hosted a series of 5 and 10k races all over the country. These are women only races, set in city parks. We both enjoyed the run, although I found it a bit tough in the warm sunshine, but we finished happily holding hands to big cheers from the supportive crowd. Goody bags, medals, and tee shirts gathered, we were thrilled to be rewarded with a glass of bubbles to toast our efforts. Time for a mooch on the few trade stalls, obligatory selfie and a big ice cream before going off to spend a day in the sunshine. September 18th, and I was this time in Cannon Hill Park, Birmingham, meeting up with Amanda Ellis. Again a nice morning although a bit cooler to start, a nice morning to run. Again, well signposted within the park, chip timed and pacers as before. This was a lot smaller than Liverpool, just around 250 ladies between the 2 distances. Maybe not as well organised but was fine didn't cause any issues. A couple of trade stalls, and stands to shop at if you fancied. After a quick warm up, we were off the course was very varied, Tarmac paths within the park, muddy trails through woods, and a couple of grass fields. Quite flat but a couple of uphill stretches and hump back bridges to negotiate. Water station available but badly positioned and not very well organised handing out bottles, good support from park users and family supporters alike. We both got over the 10k distance so not sure it was that accurately measured, but that didn't affect us too much. There was a 5k option too, although only a few entered this with a winning time of 29 min, I wished I'd taken that option, I might of won!! and would of only had to negotiate my nemesis of running the off road once. Nevertheless we made it round and both finished quite strong. Again same goody bag, medal and tee shirt. Pics taken, we said our farewells and Mart and I went off to partake in coffee and very nice cake in the park coffee shop and Amanda to celebrate with ice cream. No bubbles in Birmingham, but a nice relaxed supportive run. Clear blue skies but a crisp morning greeted us on race day. We arrived with plenty of time to soak up the atmosphere and collect our very bright t-shirts. The race started from King Edward VI Leisure Centre. My friend and I stood in the 50 minute plus area and kept a keen eye on the 50 minute pacer - there were a number of pacers ranging from 40 minutes up to 65 minutes, clearly visible with big flags attached to rucksacks on their backs !!!. The count down began and we were off - the 50 minute pacer was off like a rocket!!!! We went down the town in the opposite direction to the cathedral and managed to catch up with pacer - he'd obviously gone off to fast lol. For the first 4k we kept up with him until we hit a hill that seemed to go on for ever!! At the 5k point the timer clock said '25:00', it definitely felt fast. Tired legs started to set in but as we entered housing estates people on the side of the roads cheered us on which was a great help. The 2nd 5k didn't seem to go so fast and I remember seeing the 7k marker and thinking that surely that should be 8!! Another short hill was on our route around 7k, which wasn't too bad, then it was fairly flat going back into town. A board showed that we had 400m to go, which was all uphill back to the leisure centre and then across the field to the finish line. There were a total of 981 runners and the organisation seemed to be spot on. When you finished you got a very nice medal, t-shirt (if not collected already), banana and water. There was also the opportunity to view your provisional times. Around the route there were lots of marshals, water at 5k and as your name was printed on your race number it was great to have people shouting out your name as you went around. I finished in 51 minutes 30 seconds, a new 10k PB and in 335th place. I would recommend this race if you like a route that, as the paperwork said, is 'generally undulating with some hills'. Having entered the ballot back in the dark days of winter, and against the odds making it through and getting a place in the Worlds biggest half marathon, a few weeks of training and the day was finally here. 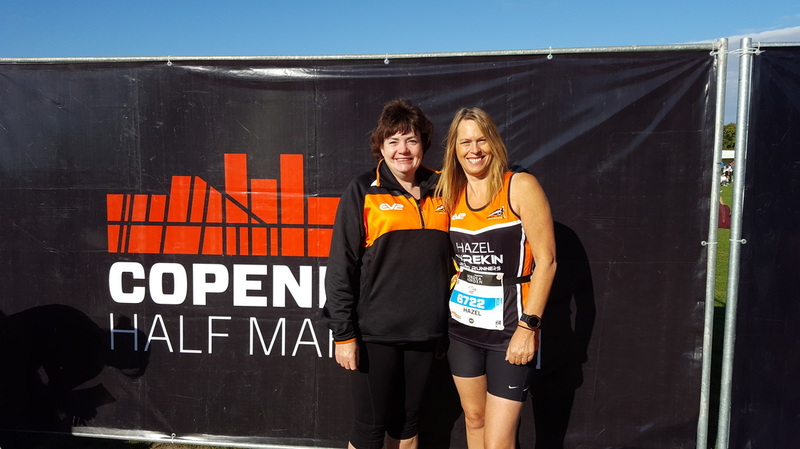 I was lucky to have run it back in 2014, with Hazel and Lorraine alongside me for company, but this time I was flying solo. I'm sure you've all watched it on tele for years, but the atmosphere and experience really does take some beating. To set off alongside the worlds best, the well known celeb, and the thousands of amazing people all with a story raising millions of pounds for charity. All running the same 13.1 miles, every inch of it lined with cheering crowds. So having caught the metro to the start, dropped my bag in the baggage bus, queued for that last min loo and got into the right pen. All that's seems an achievement with 54,000 others doing the same. The weather was warm, maybe too warm bright sunshine. Obligatory warm up done, and 28 minutes behind Mo, I was off. Next stop South Shields... Trying not to get caught up in going too fast to start, trying to stick to what I know will get me through, and taking in the great vibes I'm at Tyne Bridge, wave to cameras, chat to anyone and everyone. I was running for Anthony Nolan, suddenly fellow runners are your new best friends. Most of the run is on dual carriage way, although with the amount of runners sharing your space it does seem crowded, great fun but maybe not one for a Pb too much congestion. Miles are ticking away, sun still shinning, past my charity cheering points, they make you feel like the winner the encouragement was amazing. As you'd expect, lots of water and lucozade stations, a shower or too if you fancy a cool down, and just miles of people cheering you on, calling your name, high 5ing you, offering everything from oranges, to jelly babies to a small beer, at mile 10!!! I did this time take a tiptop from a lovely family at mile 11, by then I was more than ready for a cool down, that mile 11-12 is hard, but rewarded with a steep downhill, to the final mile along the seafront. Well chuffed I'd made it in time to spend my last mile watching the Red Arrows display over the sea, lots more waving and big smiles the finish is in sight.... A very welcome sight after 13.1 sunny miles, would do it all over again just for the experience, the fab people you meet and just so as you can say you were there running with Mo and his mates. Best bit this year I made the TV, twice in the highlight programme, looking remarkably smiley after a fab Geordie Day. So for all those thinking about it just do it, enter the ballot, it's quite a tough race a few hilly stretches, but one you won't regret, yes it's quite expensive but well worth the money for the people that just make you feel amazing . You need to be organised with your transport plans, and meeting your folks afterwards, there are lots of options for accommodation and loads of online tips n hints. But do it you'll be buzzing like I am still. It all started during an Easter visit to my friend Lorna in Switzerland – “Why don’t you and Manda come over later in the year and we can all run a half marathon together?” It all sounded so promising until she dropped the bombshell… no medal!!! I was convinced this would be the deal breaker as Manda covets the bling. She hadn’t been to Switzerland though and this was an ideal opportunity - the flights were quickly booked before she had a chance to change her mind. Several months later, we’re in Switzerland preparing our race bags with the usual wet wipes and oversized jogging bottoms to be told there would be changing rooms and shower facilities. “Aren’t there usually showers at UK races?” asks Lorna……errrm no! We met three other members of Lorna’s running club at the local train station and departed exactly on schedule (not like our 2hr easyJet delay!) and although the journey involved two changes, the six of us managed to sit together all the way to Sarnen. A very different experience to travelling from Telford to the Birmingham Half by train…. On arrival in Sarnen things started to get a bit surreal. We were directed from the train station by French mime artists waving madly, making repeated running gestures and pointing us towards the starting area. 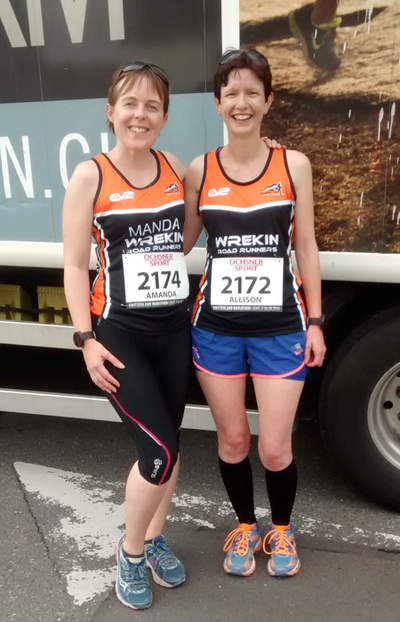 We collected our race numbers, race t-shirts and dumped our bags in the changing rooms (yes, they really had changing rooms!) and PROPER toilets, with loo roll, as well as the odd portaloo thrown in for good measure. There was also a separate area to drop off valuables. 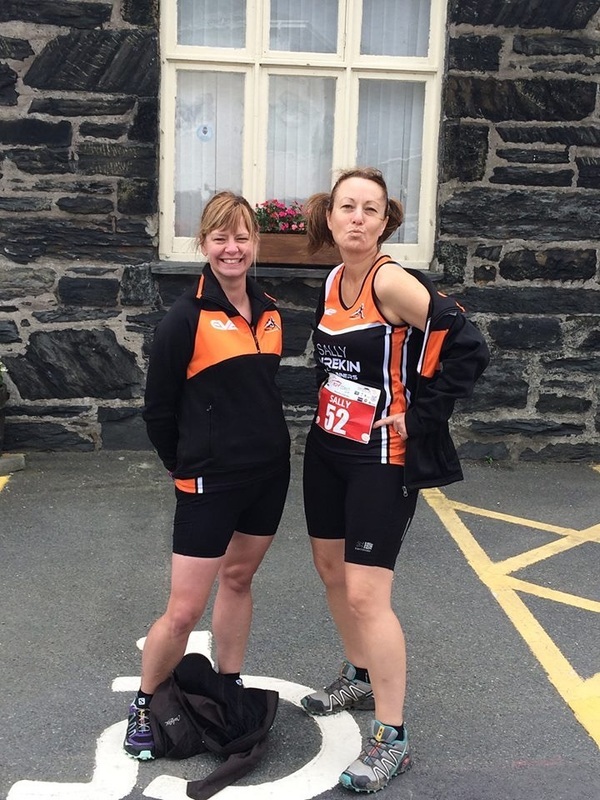 Unfortunately we missed Lorna at the start line as she went off to do some serious warm up exercises involving intervals and other painful sounding stuff with her club coach (we politely declined their offer to join them in favour of a few knee lifts and a gentle jog!). Our block was due to start at 11:04, just after the faster runners starting at 11:00. Unsurprisingly at exactly 11:04, our group progressed to the start line. It was a great atmosphere and for the first 4½ miles everything was going well. I don’t know whether it was the heat, the humidity, the altitude, or the fact that I’d not been feeling too well during the week but at 5 miles I began to question whether I would actually finish. I was desperately thirsty all the time and couldn’t get my breathing sorted. Although we had planned to take the race at a steady pace, I was already struggling and reassured Manda that she should go on ahead and leave me to bimble along. Slowing down, I realised I had other more pressing concerns. I don’t do alfresco peeing and besides, I was worried I’d be breaking some strict Swiss by-law. All of my worries disappeared at the water station at 10k as I spotted the welcome sight of a blue box. 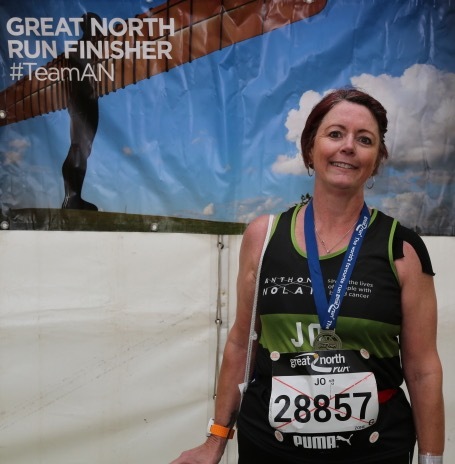 Not the TARDIS (which would have been useful in getting me to the finish line), but a wonderful portaloo – relief! After regaining my composure, I still found it a struggle to run, but decided to settle into a walk/run routine and relaxed and enjoyed the route. The biggest cow bells I’ve ever seen (Jennifer Harrower, you must get one!) being rung using the knees. An archway of enormous cowbells strung across the road. 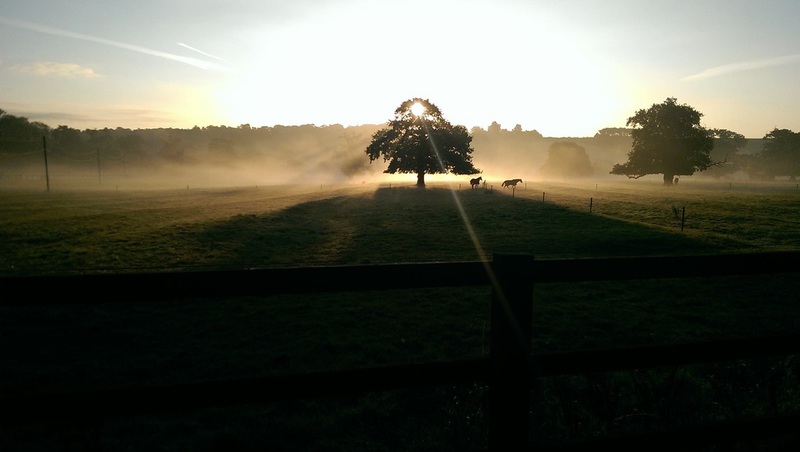 Did I mention the stunning scenery…? All this meant that although I was struggling along, the whole experience was amazing. An added bonus was that the race photographers had a large flash on a pole so you could see where they were positioned before you reached them. This meant I had chance to break into an athletic run as I approached so hopefully there is no photographic evidence of me taking a gentle stroll. With only a mile and a half to go I was determined to run all of the last stretch. Luckily, Lorna’s coach had already warned us that the start line wasn’t the finish, but that we’d continue through it and run into the sports track around the corner. As I ran through the starting arch, the announcer called out “Allison Haycox, Telford, Grande Bretagne”. 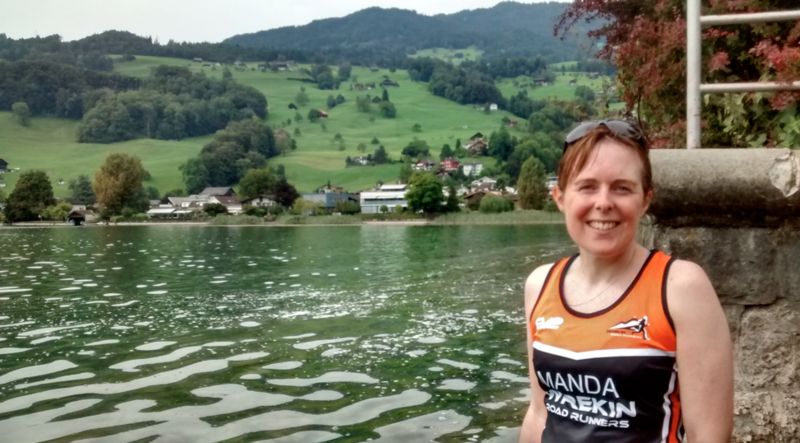 While I contained myself to grinning like an idiot, Manda confessed that when her name was announced she raised her arms to the adoring crowds…. I was so glad we had been prepped as we passed through at least 2 more finish-line looking archways before finally reaching the actual one. We headed off for a paddle in the lake to cool our aching legs and further admire the stunning scenery. We then made use of the shower facilities, which by now were a bit cold but still surprising clean given their usage, before soaking up the atmosphere and grabbing some well-earned potato wedges. Overall, this race can be summed up as both my worst and favourite half marathon. Although I ran like a bag of spanners, I absolutely loved it! 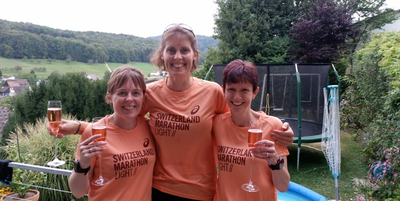 I realised that day that running is not just about the clock – it’s about fantastic friends, meeting new acquaintances and amazing new experiences.